Read Thursday's newer story: "Fox says Donald Trump is not telling the truth about debate ad rates"
Fox News host Bill O'Reilly told Donald Trump on Wednesday that he's making a "big mistake" by skipping Thursday's GOP debate. But Trump is not budging. O'Reilly pleaded with Trump to reconsider, even invoking Trump's Christian faith and the tenet of forgiveness to say that Trump should forgive Megyn Kelly for tough questioning. Trump responded by bringing up the "eye for an eye" principle. The GOP frontrunner is planning to hold a "special event" to raise money for veterans at the same time Fox hosts the final primary debate before Monday's Iowa caucuses. "We're going to have a tremendous event," Trump said, adding that "a lot of money is going to be raised." So in essence Trump is counter-programming the Fox debate to undermine the TV network. The candidate is tapping into growing anger toward Fox on the right. In a tweet on Wednesday night, he even bragged about hurting Fox's advertising revenues. "Trump has beaten Fox," radio host Hugh Hewitt said on Thursday's "CNN Tonight." At the same time, others are crediting Fox News chief Roger Ailes with standing his ground and supporting Kelly amid Trump's tirades against her. Trump and Ailes are in a standoff of sorts. The two men did not speak on Wednesday. But the taped interview with O'Reilly went forward, partly because it was scheduled well before the current controversy. O'Reilly seemed to be lobbying Trump on behalf of the network, even going so far as to say that "I don't think not showing up for debate tomorrow is good for America." At the end of the conversation, he asked Trump to reconsider the 24-hour-old boycott. "Consider it," the host said. Trump shot back that "you and I had an agreement that you wouldn't ask me that." And he declined to reconsider. Then he plugged his 9 p.m. fund-raising event at Drake University. It was an extraordinary moment of television -- and it suggested that Trump has all the power right now. He criticized Kelly on Fox just an hour before Kelly's own show. 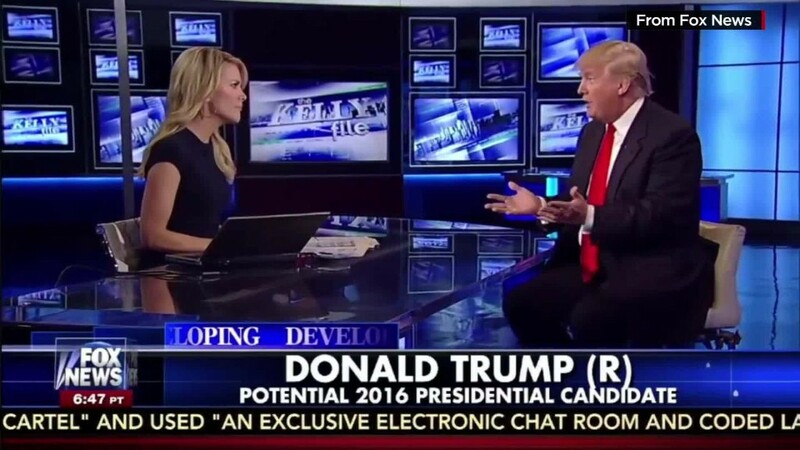 "I have zero respect for Megyn Kelly," Trump said. "I don't think she is very good at what she does. I think she is highly overrated." O'Reilly did little to defend Kelly. For days Trump has been calling Kelly "biased" and claiming she shouldn't be allowed to moderate the debate. On Tuesday, after he taunted Kelly in an Instagram video and polled his Twitter followers about whether he should skip the debate, Fox fired off a statement that dripped with mockery. "We learned from a secret back channel that the Ayatollah and Putin both intend to treat Donald Trump unfairly when they meet with him if he becomes president," Fox said. "A nefarious source tells us that Trump has his own secret plan to replace the Cabinet with his Twitter followers to see if he should even go to those meetings." Trump was incensed. He went after Fox -- an almost unfathomable move for any Republican candidate but Trump, since Fox is the favored TV news source of the GOP. But since many Fox fans are also Trump fans, the candidate is driving a wedge between them. Speaking with O'Reilly, he said the "ridiculous" Fox statement seemed to be written "by a child." (In fact, Ailes was involved in its drafting.) He called it a "taunt" by Fox. In Wednesday's interview, Trump repeatedly referenced the GOP's six past debates of the season and remarked: "We are going to go on forever with these debates. At some point you have got to start doing other things other than debating." But he also said, "I don't mind debating. I actually like debating."